If you care about your health then you must be aware that Vitamin C is able to promote vitality and general well-being. 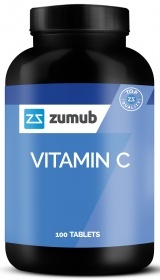 Fruit and vegetables such as oranges, kiwi, brussels sprouts and broccoli are abundant in Vitamin C. Then, it will be fair if you wonder - why would I need to take Zumub’s Vitamin C 500 Capsules? Let us answer with another question. We are almost sure that the hectic pace of today’s world doesn’t leave much time to plan a well-balanced diet with a diversity of fruit, vegetables and berries. Moreover, following such a diet becomes next to impossible. Scientists believe that taking 500 milligrams of Vitamin C on a daily basis can ensure visible health results. Zumub designs their products with one and only thought in mind - our food supplements must make a difference to your healthiness. That is why our capsules contain the best possible concentration of Vitamin C.
And all that with just one capsule a day! Here at Zumub we may not be magicians but we know how to make wonders - Vitamin C 500 Capsules is just one of them. Have a question about Vitamin C? What is it, what does it do, how and when to use or something else? Ask us. As a dietary supplement, take 1 tablet 1-2 times a day, or as suggested by a healthcare professional. WARNINGS Vitamin C : Do not exceed recommended dosage. Keep out of reach of children. This product should not be used as a substitute for a varied and balanced diet & healthy lifestyle. This product should not be used in case of hypersensitivity or allergy to any of its constituents. Store in a cool, dry place. Please Recycle. BEST BEFORE: Please see lot number and expiration date stamped on the packaging.